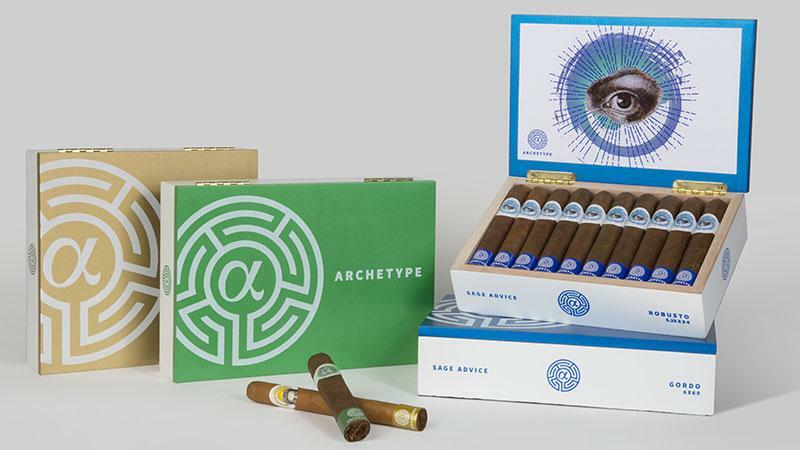 The Ventura Cigar Co. is evoking the collective unconscious of the cigar-making world with a new brand called Archetype. Five new blends have been created for the brand's debut: Dreamstate, Sage Advice, Strange Passage, Initiation and Axis Mundi. According to Ventura, these intellectually probing smokes were inspired by the works of Dr. Carl Jung and mythographer Joseph Campbell. Dr. Jung, a 19th-century psychologist, coined the term "collective unconscious," which refers to notions of the subconscious mind that are prominent across all cultures. Central to this theory are Jung's archetypes, the characters and motifs that exist within the collective unconscious of humanity. It was Joseph Campbell who then took these Jungian archetypes and applied them to existing myths and religions in his seminal work The Hero with a Thousand Faces. In keeping with the theme of universality, Ventura produced these blends at three different factories located in three different countries. Dreamstate and Sage Advice are rolled at Occidental Kelner Cigars, located within the Davidoff facility in the Dominican Republic, while Strange Passage is produced in Honduras at AgroIndustrias Laepe S.A. Initiation and Axis Mundi are made at La Gran Fabrica Drew Estate in Nicaragua. Ventura has divided the brand into two categories: Series A consists of the Dominican and Honduran cigars, while the two Nicaraguan cigars makeup Series B.
Dreamstate sports a Ecuadoran Connecticut wrapper over a San Vicente binder also from the Dominican Republic. It's available in Robusto, measuring 5 inches by 52 ring gauge ($9.99); Toro, 6 by 50 ($10.99); and Churchill, 7 by 48 ($11.99). Sage Advice features an Ecuadoran Habano wrapper with Dominican San Vicente binder and comes in three sizes: Robusto, 5 1/4 by 54 ($10.99); Toro, 6 by 52 ($11.99); and Gordo, 6 by 60 ($12.99). The box-pressed Strange Passage is made of Ecuadoran Habano wrapper and Dominican San Vicente binder and is available in Short Robusto, 4 1/4 by 50 ($8.99); Robusto, 5 1/2 by 54 ($10.49); and Toro, 6 by 60 ($12.49). Ventura did not wish to disclose the filler tobaccos used in the Series A cigars. Initiation is made with all-Nicaraguan binder and filler covered by an Ecuadoran Habano wrapper. It will come in four sizes: Corona, 5 by 46; Robusto, 5 by 54; Toro, 6 by 52; and Churchill, 7 by 48. The cigars will retail from $9.99 to $12.99. Axis Mundi sports a dark Habano wrapper, Indonesian Sumatra binder and Nicaraguan filler. It's available in four sizes: Corona, 5 by 46; Robusto, 5 by 54; Toro, 5 by 52; and, Churchill 7 by 48. The line carries a suggested retail price between $10.49 to $12.99. All Archetype cigars come in boxes of 20 and are in stores now.